aluminum anodized frame and blow-molded bench, it features a reversible set back for right or left handed transfers. The angled legs have one-inch, easy-snap button adjustments and wide-based, non-skid feet for added sturdiness and safety. Tool-free assembly and limited lifetime warranty are standard. 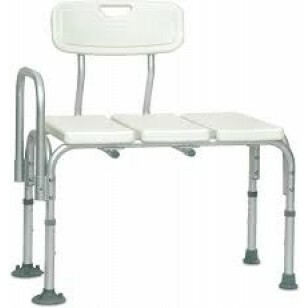 Adjustable Seat Height: 19" - 23"
Carton Dimensions: 28" x 17" x 11.5"